Welcome back, gnarly pips! After some 3 and a half months since the first fruits of 2017 were pulled off of the trees, the apple harvest has concluded. This was a very interesting year ! By all counts, it was a very abundant year for orchardists and foragers alike. May we all share in Winter’s quiet tone as we hunker down with our Winter reading and planbooks as we anticipate the New Year and dormant season work-to-come. A squeaky clean orchard, Small Ones Farm, MA The refuse can be used as animal fodder. Ruminants and pigs go crazy for the stuff! After the trees drop fruit and defoliate, usually by late November in New England, I rake out leaves and rotten fruit to minimize the inoculum of fungal diseases like apple scab, cedar apple rust, downy/powdery mildew, and more. This is the process of laying an orchard to sleep. Although this is the definition of tedium, and a much more physically demanding version of raking (fruit and moisture holding leaves together are heavier than drier yard leaves, and one must dodge and duck under branches to get the nooks & crannies), it is an invaluable step not only in maintaining a disease-free orchard, but also in the personal process of unpacking the harvest, contemplating dormancy and how to improve for next year. 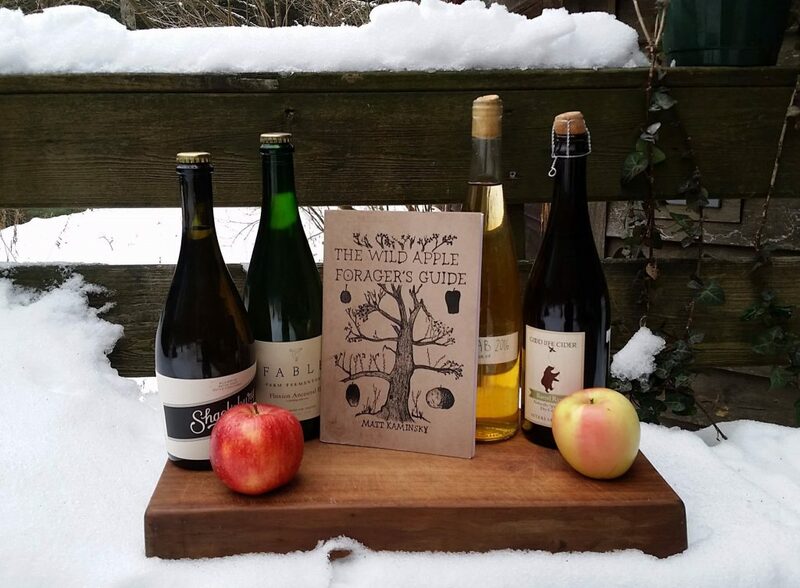 Since this post is hugging up // late to the Xmas//Chanukah scene, I just wanted to slide these in here since my publisher just restocked me on copies of The Wild Apple Forager’s Guide! Any orders placed in the next day or two will be rush shipped to get to you in time for wrapping. Book and Patch bundle is now available. Read the book and rep the team colors of wild apple people everywhere! Rep the team, spread the wild apple word! Rainfall has an indisputable impact on apple trees. On the cultivated orchards (Small Ones Farm and Carr’s Ciderhouse, USDA zones 5b and 5a), we noticed trees sizing up the crop earlier than usual, and trees dropping fruit 2 to 3 weeks before typical harvest date, dependent on variety. A good reference for “marker apples” are Summer cultivars, or apples that ripen and drop before mid September. In New England there are very few wild Summer varieties, but cultivated summer apples (Lodi, Yellow transparent, Ginger Gold, Canadian Strawberry) consistently reached a maximum Brix reading 2 percent lower than in a “normal” year. An early and watered down apple crop is better than naught though! For our late apples, mother nature’s mood swings were particularly pointed. Hot and dry summertime temperature into middle October were consistent. This is rather unusual; New England apples typically have the opportunity to sugar up from lower temperatures during Autumn nights. This is another reason why Brix readings may have been lower, dependent on location and seasonality of the variety. All of a sudden, freezing temps in the low 20s come along and froze some of the late apples still on the trees, Gold rush, Court Pendu Plat, Nailbiter, Yellow Newtown Pippin, which was a downer for any apples primarily used as table fruit. This year, both new trees as well as old favorites were visited and collected from. Though some of the old favorite trees (Queen Crab, Old Fertile, Nailbiter, Footrace, and more listed in the sections below) had more scant harvests than in 2016, they nonetheless bore in consistent fashion with the fruit characteristics in previous seasons. This, to me, is a good sign for the ways these unpredictable climactic conditions may affect our precious trees! This not-insignificant miracle is just another reminder that the infinitely adaptable wild apple has such amazing resiliency. Scion wood from all of the apples in the above slideshow will be available this Winter. A more complete list of varieties will be coming in the next couple blog posts. This is just a taste to whet the palates of all you wiley grafters out there! Email matt.s.kaminsky@gmail.com for information on scion wood ordering and varietal selection. 20 bushels of apple foraged in VT going to the press for the 2017 Wild Apple Blend from Carr’s Ciderhouse. The blends going to cider were a mishmash; sort of a product of all these conditions, and our reactions to them. Though the starting brix of many batches of must didn’t exceed 14 brix, the warm temperatures got wild yeast fermentation running immediately. Our early season wild yeast ciders took off like Usain Bolt in London. Usually there are no ciders finished metabolizing all sugars until April or May…after the thaw. This year we have two batches down to bone dry before Christmas. Unbelievable speed of fermentation. We will just have to wait and see how they turn out. Here’s some rosé cider being pressed. About 215 gallons of cider were pressed from The Gnarly Pippins Harvest. 150 gallons makes up the 2017 Wild Apple Blend from Carr’s Ciderhouse, the rest are the spoils of my personal cellar. The rest of some 15 bushels were food and fodder for the homestead, and the stockyard claimed the apples set aside as rotten in the sorting process. Reach out to me if you’d like to claim some of the private stock, or visit me at select farmers markets (listings available via Carr’s Ciderhouse social media) to sample and pick up the 2016 wild apple blend at market. Blurry photo of a shot glass of must from the debut pressing of Kingston Black at Carr’s Ciderhouse, unsprayed and unfertilized. Liquid gold — Limited to 33 gallons. Lastly, I am looking forward into Winter, getting excited to continue on this wild apple journey with new friends, clients, trees, and tools. During this part of the season, it’s always a good idea to strategize about the nature of the pruning you’ll do to a given tree. Questions I ask are: have these trees been pruned before? If so, how long ago? Did the tree bear fruit this year? Is it biennial? Do I have the tools and experience necessary to prune this tree? Is my equipment carrying disease from other trees? Sometimes, even though there’s a pair of snips in my pocket and a saw in the trunk, you need to take some moments to think through this process before getting out and doing a bang-it-up pruning job on an apple or pear tree. Sometimes a chainsaw is the choice that will leave a tree the happiest, sometimes using snips is a waste of time. It depends on the case. Throughout the Winter, think about these questions and how they apply to your apple trees! Stay tuned for more blog posts about pruning. Don’t forget to reach out! I will be selling custom made pruning saws this winter during my quiet moments of Winter. Long and short blades fitted to your specifications. Apple wood and more available! Email me or comment on this post to get yours started. It will be in your hands within 10 days from order, ready for pruning season. Sheath optional, spoons for fun! Pruning saws with apple wood handles and leather, belt-mounted sheaths. Thanks again everybody. Don’t be a stranger: Email me about anything!